Stacy Horn » Blog Archive » Why do I love the Oscars so much? Why do I love the Oscars so much? I really don’t get it. For years now I haven’t seen most of the nominated films. I used to go to the movies constantly and I went to pretty much every movie released every year, but for some reason I don’t do that anymore. So for the most part, I am not familiar with the movies people are voting for. And yet, I love the Oscars. It’s like a holiday. I make sure the house is all clean and fresh and nice. I plan and buy delicious snacks to last from the pre-shows on (in the past that meant onion dip and potato chips, now I go for healthier snacks like carrots and broccoli and olive tapenade). I get all set up on my couch with my laptop, and do my best to lure people on Echo into watching and commenting with me. I’m in a good mood today because the Oscars are on tomorrow. WHY? 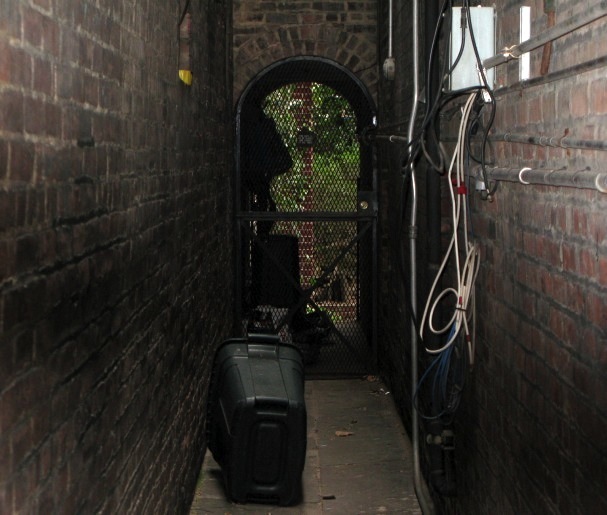 A garden/courtyard down an alley and behind a building. Adding to my list of things I want when I am rich (and time is running out for that to happen): a semi-secret garden. If this were my semi-secret garden though, I would make an effort to make the alley you walk through to get to it more enchanting. I would make it like that scene in Cocteau’s Beauty and the Beast, when Beauty walks down a long corridor when she first enters the castle — it’s lined with lamps, held out by disembodied hands (sounds scary but it was more magical). I don’t know why either, but I am like you – hardly see the films, but love to watch the evening of awards. I don’t live near a cinema, which is my main excuse for not going. I used to live two blocks from a cinema when I was a poor student in the 70s, and I went to the movies almost every week, on “$2.50 Tuesdays” and to see the cheaper matinees. Maybe one day, I will live close to a cinema again.